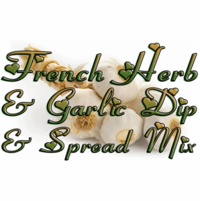 French Herb & Garlic Spread Mix by All Miced Up, Ltd. If you like rich, creamy Boursin R cheese, you'll love this! Fresh-tasting herbs with the bite of garlic. Spread on bread and crackers; use it to stuff mushrooms. Also makes a garlic herb dip. All Natural Ingredients. No added MSG. Gluten Free. Vegetarian / Vegan.